Lady Chatterly enjoys all of her subjects, but she takes a particular delight in learning math. We have a whole 9 cube organizer devoted to manipulatives, math games, puzzles, white boards, chalk boards, math toys, building toys and various math kits. We watch math, sing math, read math, dance math, write math, draw math, and play math. I love all of the ways she learns naturally. We also, nonetheless, use our fair share of math curriculum and are always on the lookout for a great game. There are all kinds of games on the market, but most computer based games are really just animated worksheets. I was looking for a game that would provide an immersive experience, but one which would still teach math skills. We have recently experimented with several role playing games. The first is Prodigy, which is a math role playing game. 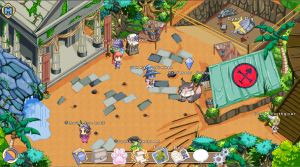 Lady Chatterly is given an avatar in the game and then must visit a variety of lands to assist the residents with their problems and to collect animal companions. She and the animal companions learn spells and gain in strength by doing battle, which means solving math problems. Be ﻿forewarned, we have had issues in the past with adaptive programs being able to correctly determine my daughter's level. Because she grasps concepts quickly and rarely gets anything wrong, the programs assume that she is ready to move on and advance her. Right now, the program believes that she is comfortable doing multiplication and fractions problems, but she is not. We will definitely return to the game when she has actually learned the skills to be able to continue, but for now, we have been forced to move on. Update: There have been many major updates to the program since the above review was written, and the algorithm is much improved.I had a mother ask whether or not the program teaches new material. The answer is, "not really." While there are hints provided to the student about how to solve problems which they answer incorrectly, the program really provides practice more than instruction. I usually sit with Lady as she works her way through problems, and I provide the instruction that she needs to tackle the new concepts. Last year we used Dreambox Math because so many other people raved over it. We had a similar problem with the program being able to gauge her level appropriately; however, there was an additional problem just in terms of the structure of the program itself. My daughter quickly grew tired of the games and found them to be repetitive and boring. Lady Chatterly does not tolerate worksheets very well and hates drill. In addition, many of the activities were timed, which just made her panic and freeze. If, however, you have a kid who enjoys solving lots of math problems quickly in a series of animated worksheets, then this might be a good fit. We just discovered an app for the iPad called Twelve a Dozen which my daughter wants to play nonstop. It features a character named Twelve who makes its way through a maze-like landscape solving math problems in order to restore order to its world. Operators (addition and subtraction) are small robots which transform the numbers that the child puts together. Certain numbers also have special powers in the game. She has to make her charcter leap and climb and traverse the game landscape. Lady Chatterly's only been playing with it for a couple of days, but the game format makes her keep wanting to play, which means she's getting plenty of repetition and practice with nary a squawk. Now if only there were a program that could make handwriting this much fun! Today we tried a new program called Mathbreakers. This program features a robot avatar who collects number balls and performs mathematical operations with them by throwing the balls at different objects in the environment. Numbers can be combined (added) by throwing them together. Adding the same number to itself helps the child to develop an understanding of multiplication. Adding different numbers strengthens adding skills and encourages the retention of addition facts. The goal is to zero out the obstacles and enemies in the game, so the child becomes comfortable with the concept of negative ﻿numbers ﻿and with subtraction. The demo did not allow us to explore other mathematical operations, however, a YouTube video showed that the robot avatar will eventually acquire a tool which is used to divide numbers into fractions. This is a clever and engaging math program. Update: Lady Chatterly completed all of the available levels of this game and thoroughly enjoyed the math. The only possible complaint is that there were times when there was too much lag to advance through a challenge. The more moving enemies there were, the more stalls and crashes we experienced. The best part of this program is The fact that it encourages the playful exploration of math concepts and intuitive learning. ﻿A real oldie but goodie is Timez Attack by Big Brainz. I used this program with Sir Talks A Lot with very limited success, primarily because the battles with the ogres were just too scary for him. Perhaps because Lady Chatterly has been primed by battling baddies in other games, she, so far, is persevering. The upgrades in the graphics since the time that Sir used the program are amazing. This is how the game works. The child navigates an avatar through a maze like game world. The free version offers the choice between a dungeon or palace landscape, but there are several other options with the pay version. There are floating keys at each doorway which unlock an ogre or boss who must be defeated. In order to unlock the door, the student has to solve a series of math problems. The child practices the problem first, and then types the solution into the equation. This releases the ogre who shrinks in size with each correct response until he fades away. Once the ogres are cleared from the﻿ ﻿level, the child faces a boss ogre and reviews the facts learned on that level. The program offers addition, subtraction, multiplication and division landscapes. Update 2: Big Brainz has sold their software to another company, and the focus is now on school users instead of at home users. The old program still appears to be available for download on their site, but it is not going to be updated or upgraded. If you already own the program, it is still operational. Although we use a lot of online games in our learning, sometimes there's nothing like a good, old-fashioned board game to fit the bill. The Magic Cauldron Game is just such a game. The premise of the game is simple. There are picture cards with numbers on them. The players select a card, and then have to find an equation (addition or subtraction) for which the card is a solution. They can check their work by rubbing on the equation card, which causes the solution to magically appear. 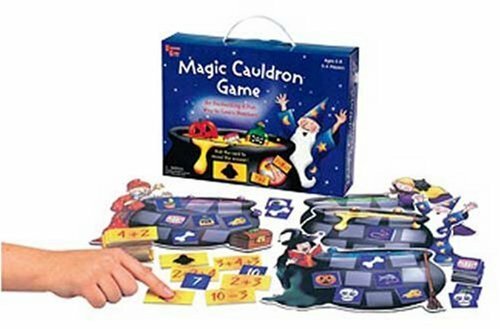 If the answer matches the number on the picture chart, the player gets to put the card into the cauldron and build a potion. The winner is the person who fills his/her cauldron first. This is an excellent game to practice basic addition and subtraction. I really want to like this game. In fact, I bought it when Sir Talks A Lot was a little tyke with the intention of using it while he was learning multiplication, and then exhumed it again once Lady Chatterly was of age to find it useful. There is a lot to like about this game. First, there are cards featuring gods, warriors, monsters, and heroes from mythology. In the deck we own, the two traditions featured are the Celtic and Greek, but there is also a set of cards featuring Norse and Roman mythology. The cards are lovely and feature all kids of information about the characters depicted on them. There are also additional magic and weapon cards which can change the value of the card. As I see it, there are a few drawbacks with this game. First, the mythology is not really essential to the game. The only characteristic that matters on the cards are the attack and defense ratings. This means that if a player is lucky enough to acquire high cards, they are virtually unstoppable (even with the additional cards which can alter the face value), and the game stalls and becomes boring. There are also contingencies which are not covered by the rules like a tie between attack and defense. Owning both sets of cards might offset this a bit. That said, if you are clever and motivated enough, you can come up with your own rules or your own tweaks to make this a worthwhile learning system. Unfortunately, card games do not really inspire me, so this is a game that I have played exactly twice (once with each kid). The rules are simple, the game is affordable and adaptable, so I would encourage dueling card fiends to give this one a whirl. Each player uses his own Mythmatical Battles Deck, with 55 cards featuring gods, heroes, and monsters from Greek, Celtic, Norse, or Egyptian mythology. Every card has one multiplication equation for its attack strength and one equation for its defense strength. A single deck contains all the multiplication equations from 1x1 to 9x9. The players take turns drawing cards from their decks, placing them face-up to the "Field" (known to grown-ups as the table, desk, or floor), and challenging their opponent's cards. The card with the highest product wins. But look out --Magic and Weapon cards can change card strengths, and weaker cards can team up to conquer a powerful card. ​Each defeated opponent's card goes into the player's "Plunder" pile. The game ends when one player's deck is exhausted. The player with the most cards in her "Plunder" pile when the game ends, wins. A full deck game takes 45 minutes to play. Or you can play time limit games to fit into a busy class or home schedule. To win a time limit game the person with the most cards in his "Plunder" pile when time's up wins. Mythmatical Battles is designed for kids in the 3rd to 7th grade. Any kid (and there are millions) who's played with other dueling cards will quickly catch on to the rules of Mythmatical Battles, but, in the process, they'll learn classic mythology and rock solid math.